Electricity is often something we take for granted. From air-conditioning to cooking, light to entertainment, most people in the 21st century would be at a complete loss without it. Hey, you wouldn’t even be reading this blog if it weren’t for electricity! Despite how immersed we are in the electrical world, when it comes to teaching the nitty gritty principles of electricity, most of us are still stuck answering the question “What is electricity?”. Don’t be kept in the dark! 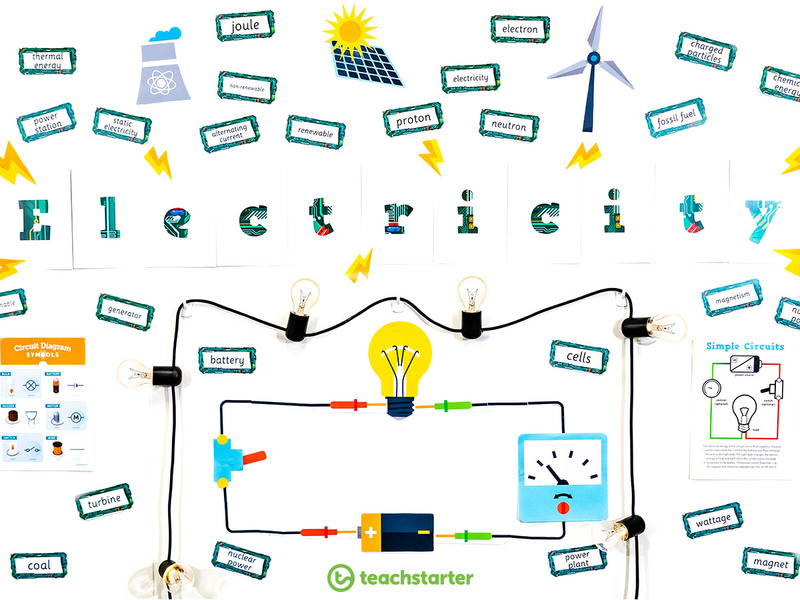 We at Teach Starter are here to give you the resources to teach your upper years students all of the information they need to learn about the history of electricity, its uses and how it is made. The wonderful teachers on the resource team have put together a comprehensive Physical Sciences unit on Electricity. It explores what electricity is, how it is transferred and how energy is transformed to create it. to consider whether energy sources are sustainable. 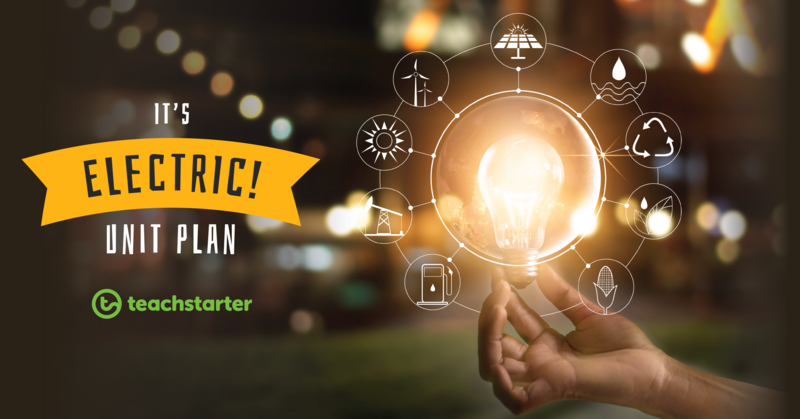 Win an Economy Electricity Kit! To get you excited for this unit, we are offering one reader a FREE printed copy of this unit delivered straight to your door, including all the digital resources for you to download. Not only that, but the lucky winner will also receive an Economy Electricity Kit (featured in this blog) for you to use with your class! We had so much fun playing around with this kit for our photoshoot, and we know your class will love it. Plus, it’s perfect for rotational or group science activities! All you have to do is make sure you follow us on Facebook and stay tuned for further details! To get your class ready for this interactive unit, begin by brushing up their knowledge on the history of Electricity. Ask students to work in groups or independently to complete the worksheet Comprehension – A Brief History of Electricity. Get them thinking about how they use electricity in their homes and at school, and what they would do without it! Once you’ve got your students ‘electrically thinking’ create a classroom display which focuses on electricity. Our Electricity Word Wall Vocabulary, Electricity Decorations and Circuit Diagram Symbols Poster go well along this Electric Circuit – Letter, Number And Punctuation Set! The word wall can be added to throughout the unit as you build on students’ vocabulary. When you’re ready, dive into the lessons of It’s Electric! the unit plan. 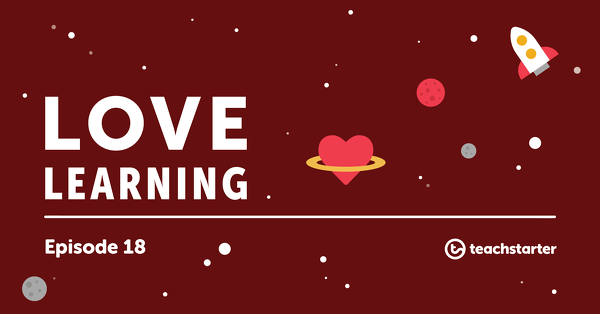 Below, I’ll give you a brief outline of each exciting lesson, but make sure you click on the headings and fully browse through the lessons as you’ll need to prepare some of the resources ahead of time! Lesson 1- What is Electricity? To open this unit, students are introduced to the basics of electricity. Where does electricity come from? How does it get here? Watch the What is Electricity video on YouTube and discuss the concepts on slides 5 – 7 of the It’s Electric! Powerpoint. 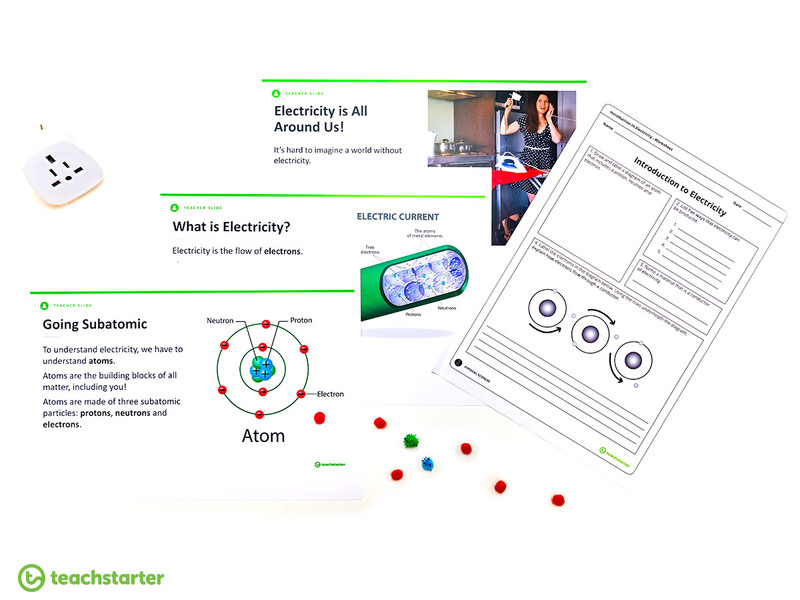 Use these resources to prompt your students into a discussion about the basic principles of electricity, before asking them to complete the Introduction to Electricity Worksheet! Words to add to the word wall during Lesson 1: ‘electricity’, ‘atom’, ‘proton’, ‘neutron’ and ‘electron’. In Lesson 2, students will love the opportunity to get hands-on with circuits! Circuits need to be (closed) to allow the flow of electricity. Linking pages 8 – 9 of the It’s Electric! Powerpoint, prompt your students to consider the Circuit Diagram Symbols Poster and discuss each symbol. What on earth could all of these strange elements mean?! Model how to draw a circuit diagram using a selection of the components. Discuss whether electricity would flow through the circuit. Repeat this activity several times, giving some examples of circuit diagrams where electricity would not flow. Last comes the fun part! 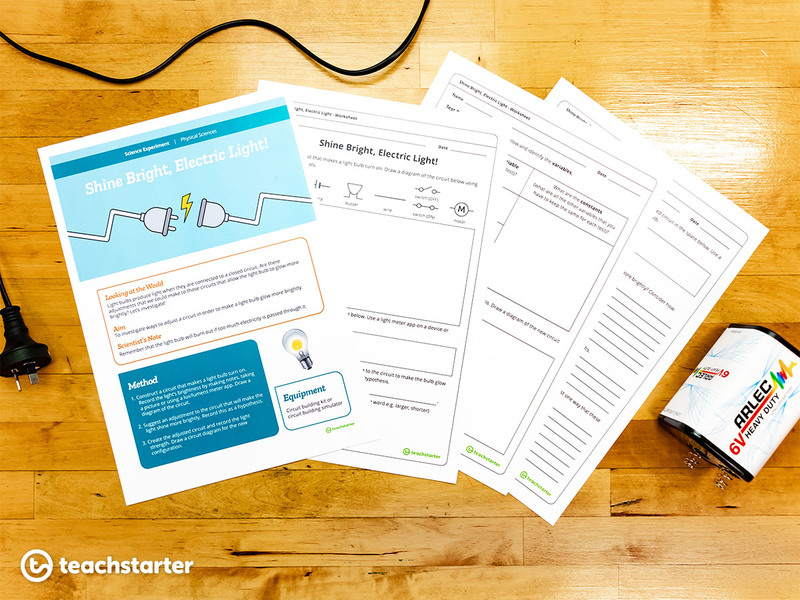 Using the Circuit Diagrams Worksheet, students will have the opportunity to test their theories with real-life circuitry. 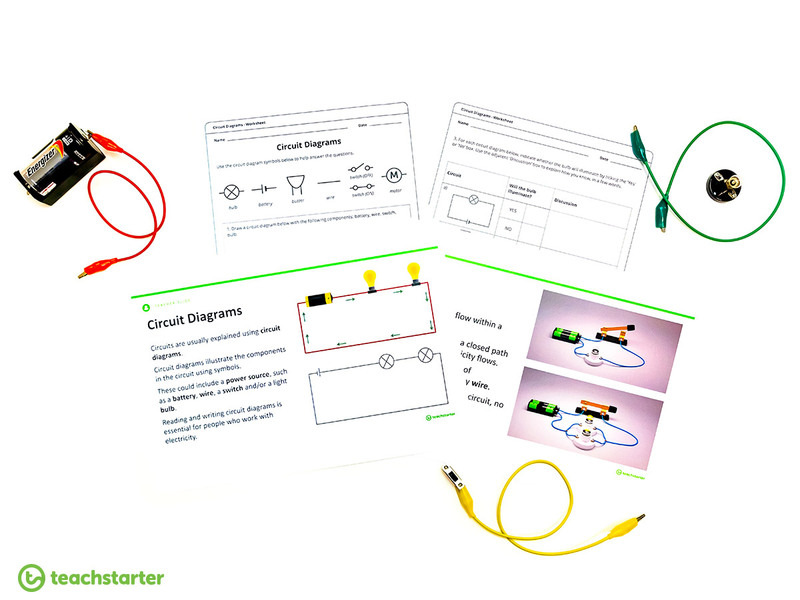 If your school doesn’t have access to a circuit kit, your students can easily access an online circuit simulator to perform the test. Alternatively, why not set up a rotational activity where students work in small groups to complete the hands-on circuit activity? Words to add to the word wall during Lesson 2: ‘circuit’ and ‘component’. 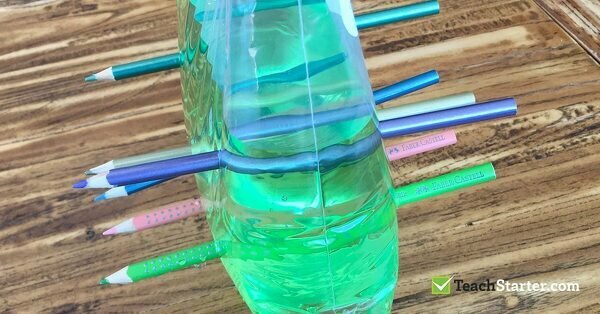 For this lesson, students will use everyday objects to classify insulators and conductors of electricity. 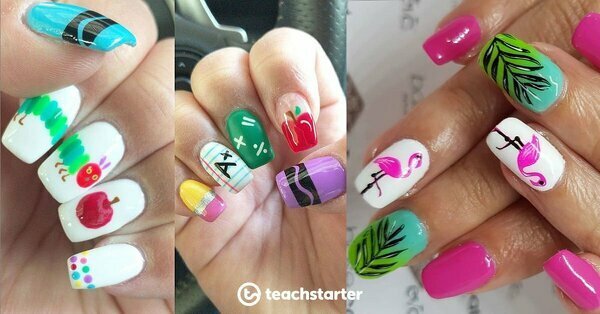 This fun lesson is also a great mid-unit opportunity to review the content that you have covered in the last few lessons! Objects can be classified as conductors or insulators of electricity. Move on to slides 10 and 11 of the powerpoint. Draw attention to the diagrams and consolidate the concept that a material’s conductive capabilities relate to the properties of its electrons. 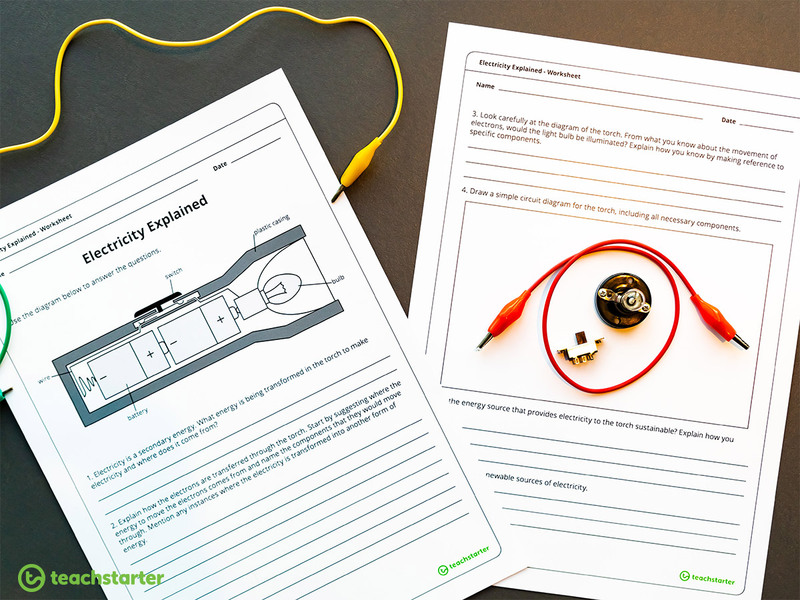 Using the Electrical Conductors and Insulators Worksheet, guide students through the activity either in small groups or independently. Words to add to the word wall during Lesson 3: ‘conductor’ and ‘insulator’. Lesson 4 – Shine Bright, Electric Light! All of your students will shine brightly with this thought-provoking investigation! Light bulbs produce light when they are connected to a closed circuit. Are there adjustments that we could make to those circuits that would allow the light bulb to glow more brightly? Let’s find out! After watching the Simple Circuit for Kids video on YouTube, students can work in small groups to investigate how changing a circuit will affect the brightness of a light bulb. Guide your students through Science Experiment – Shine Bright, Electric Light. In this exciting experiment, students will construct a circuit that makes a light bulb turn on. They will then test their knowledge to develop a hypothesis about how to make the bulb glow more brightly. 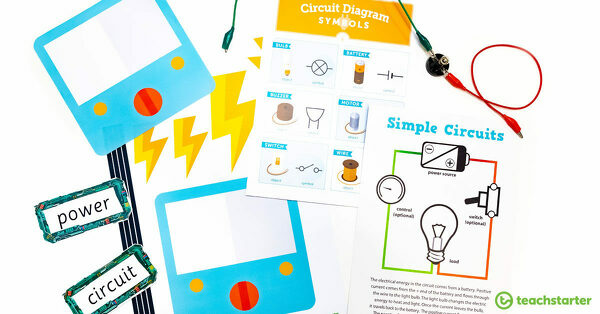 Encouraging your students to experiment with the circuit building kit can also help them to broaden their understanding of variables and the scientific principles of a fair test. Did you know that electricity is actually a secondary energy? That’s right, another form of energy has to be transformed into electricity! Mechanical energy can be converted into electrical energy. Watch the Electricity Generation video on YouTube. Afterward, display and discuss slides 13-16 the It’s Electric! PowerPoint. Ask your students how they would order the process of moving electricity into the home, with the Electricity: From Plant to Place Worksheet. You never really know how many steps are involved until you break it down! 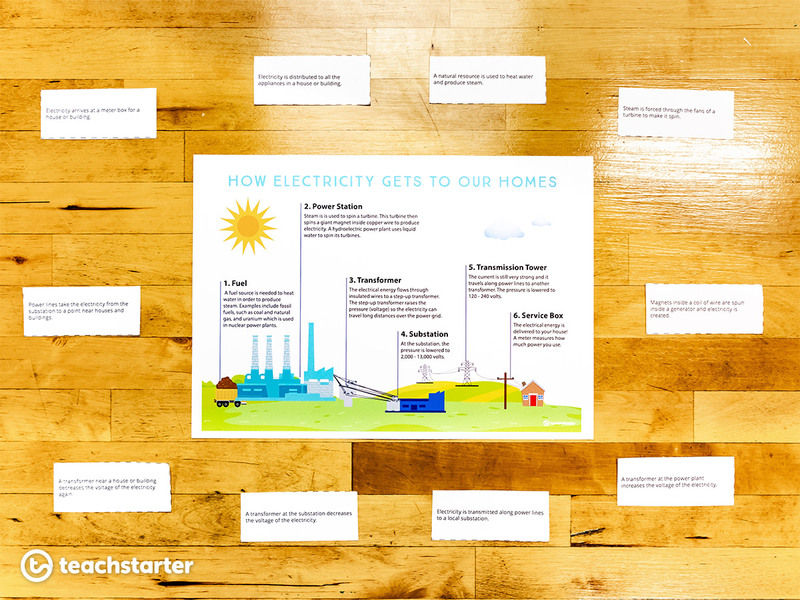 If you would like to expand your Electricity wall display, why not add the poster How Electricity Gets to Our Homes? Words to add to the wall during lesson 5: ‘transformed’, ‘power plant’, ‘fossil fuel’, ‘turbine’, ‘generator’, ‘substation’, ‘nuclear power’ and ‘uranium’. You may drive through your neighbourhood and see solar panels everywhere, but have you really thought hard about how they work? Your students may not be aware that the heat from the sun is actually energy! Not only is it energy, but it is the most abundant source of energy on Earth. So…how do we harness it? Solar Energy is a viable source of electricity. As students work through the Investigating Solar Generated Electricity Worksheet, they will be evaluating whether or not their answers mean that solar energy is a viable form of energy for creating electricity. Why not have students present their findings in groups as a persuasive speech or essay at the end of the unit? Alternatively, ask your students to turn their research into an informative text about solar electricity. Words to add to the word wall during Lesson 6: ‘solar panel’ and ‘solar electricity’. Will we have it forever? Discuss with your class the meaning of the word ‘sustainable’. 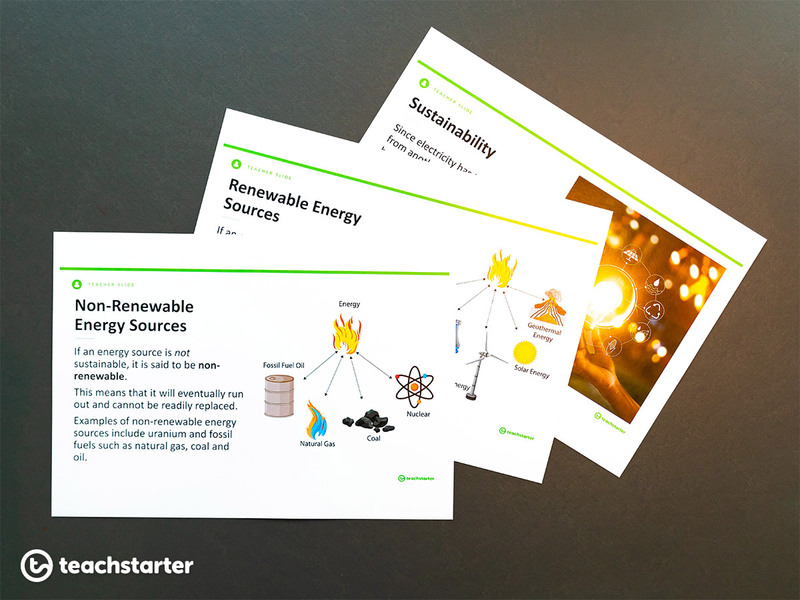 If you need, touch on some of our Sustainability Teaching Resources to help your class understand that sustainability is the ability for a resource to be used in a maintainable way for the foreseeable future. Does this apply to electricity? We’ll see! Your students will again have to use their higher order thinking skills to reflect on research and analyse their findings in the Is It Sustainable? Evaluating Sources of Electricity Worksheet. Why not take this lesson one step further? Encourage your students to think about how they can personally conserve energy and why it is important to encourage others to do so. Have them complete the Electricity Poster Challenge and display their posters around the school to make a difference! Words to add to the word wall during Lesson 7: ‘sustainable’, ‘renewable’ and ‘non-renewable’. While there is plenty of student work created in this unit to add to an assessment portfolio, you may still be looking for a culminating activity. In the Electricity Explained Worksheet, students examine a diagram of an electrical device and then explain how it operates using their knowledge of electricity. They also evaluate if the energy source is sustainable, drawing on the previous lesson. Don’t stop there! You may like to provide your students with some alternate ways to show their knowledge and understanding. create a game using people as atoms passing a ball to represent electrons. We hope you’re ‘amped up’ by our unit on electricity! Don’t forget, jump online and add us on Facebook for your chance to win an Economy Electricity Kit!